A perfect little cookie – crispy on the outside, chewy and sweet on the inside and accented with the wonderful flavor of almond. I love to read blogs and look at food photos in order to hone my baking and photography skills. Time and again, I find myself on David Lebovitz’s blog admiring his well-staged photographs and interesting recipes. A few days ago, he posted a recipe for Italian almond cookies. I’ve never made these, but have fond memories of snacking on these delicious, crunchy treats straight out of the red tin from Cost Plus. The commercially sold cookies had a bit of a chewiness inside and a nice crunch on the outside and I loved the almond flavor. When I saw David’s post, I put it at the top of my “must bake” list, in spite of the fact I had neither the almond flour nor apricot jam his recipe called for. Nonetheless, the credit for the basic recipe goes to David. His idea of using jam to enhance the cookie’s chewiness and moisture is terrific. But I did adapt the recipe to my pantry, which included swapping regular old apricot jam for fantastic Arctic cloudberry (aqpik) jam. Too good to keep for ourselves, we gave most of the batch to our hard-working office staff who had them finished before lunch. Preheat oven to 325 degrees F. Cover two baking sheets with parchment paper. Set aside. In a large bowl, mix together ground almonds and sugar. A whisk makes this job easy. In the bowl of a stand mixer, whisk egg whites and salt until they form soft peaks. Fold beaten eggs into almond mixture. Fold jam and almond extract into mixture. It’s OK if mixture loses volume. Mix dough until it forms a smooth ball. You may need to knead it a little with your hands. With a cookie scoop, scoop out dough balls and set them on parchment-lined baking sheets. 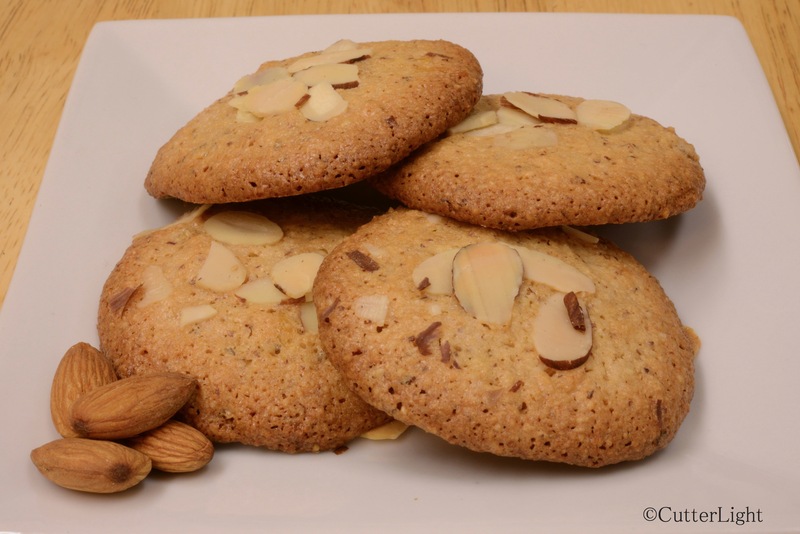 Top cookies with reserved almond slices. Bake for 25 minutes. Cookies will be a light golden brown when done. Let cool in pans and transfer to wire racks to finish cooling. Have you ever tried making your own almond butter? It’s a great change from peanut butter, and better for you! all you need is almonds, a food processor, and about 10 minutes (yes, that long) The heat of the processing will eventually extract the oils and make the butter. Just scrape own the sides of the processor bowl a few times, but other than that it is as simple as can be. Yes, we have. In the process of making nutella, we substituted almonds for hazel nuts and made almond butter. Thanks for the reminder, Erin. Mt Lebovitz? Where’s that? MR Lebovitz!!! His were rounder. I didn’t have the patience to chill the dough. Mine still tasted every bit as good as the plumper version AND I didn’t have to wait! Let us know how yours turn out. O, boy those look mighty yummy!!!! It’s been so cold and cloudy lately, not much to do but get creative in the kitchen!